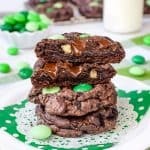 Hiding candy inside of cookies is a fun way to surprise everyone at dessert. 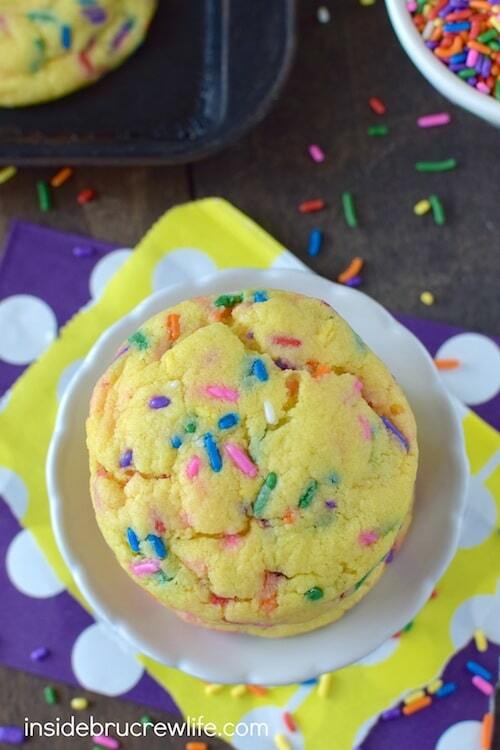 These White Chocolate Lemon Funfetti Cookies have a sprinkles and a hidden pocket of candy inside. They are the perfect cookie jar treat to share with everyone this week. I hope everyone had a wonderful Easter Sunday yesterday. We enjoyed two great services with our church family celebrating our risen Savior, then we headed out to do lunch with our family. There is never a shortage of food and laughs when we get together. And it just warms my heart to see how well the cousins all get along. Our kiddos are the oldest grandkids, and they are such big helpers with their little cousins. Ok, so second reason for celebrating this week…the 10th anniversary of my 29th birthday is coming up in just a few days. Hahaha! That’s 39 if you were trying to figure that out. Actually, I am totally ok with my age. In fact, I feel awesome, and I’m in the best shape of my life. Notice I didn’t say best weight of my life though. It’s a good thing I have decided I like to work out because my sweet tooth gets me every week. 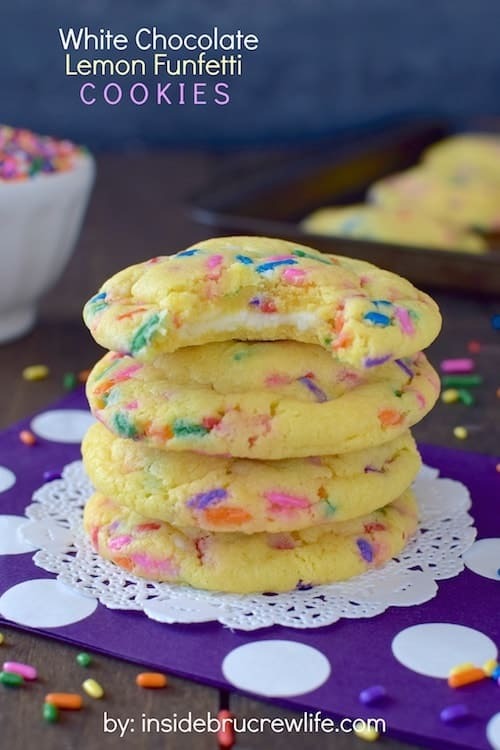 Just like these funfetti lemon cookies…they got the best of me. I finally had to get rid of them because I couldn’t stay out of the cookie jar. Can you believe that I used to think I didn’t like lemon? In fact, until just a few years ago, I used to turn my nose up at lemon treats. I would see a lemon dessert and totally just walk right on by. Then one day I tried something and realized the error of my way. I just have to be in the mood for lemon goodness apparently. Second confession of the post…I actually made these cookies two years ago and never shared them. I know shame on me for keeping the goodness from you! I just kept looking at the pictures and not liking them. But I never got around to redoing them until recently. Having your computer crash and lose pictures kind of gets you motivated to make the things you really liked. But to make it up to you, I ramped the cookie up by hiding candy inside. A few months ago I made these Cinnamon Caramel Cookies, and it was the start of a beautiful cookie trend in my cookie jar’s life. So, when I bought a bag of the white chocolate cream filled candy bars, I knew they needed to be hidden inside cookies. The cookie dough does need to be refrigerated before you add the candy inside and bake it. I usually let my bowl sit in the fridge for at least 30 minutes…usually longer though because I usually get distracted with other things around the house. After the dough is firm and can easily be rolled, divide it into 24 even balls. Flatten each one and form it around an unwrapped candy bar, then roll it up again and bake. Now here’s the thing with these cookies…Do NOT over bake them! They will look very undone when you pull them out. That’s how they should look!!! Trust me on this! The cookies set up as they cool. Leave them on the cookie sheet for 2-3 minutes, then move them to parchment paper on your counter and leave them alone until they cool! 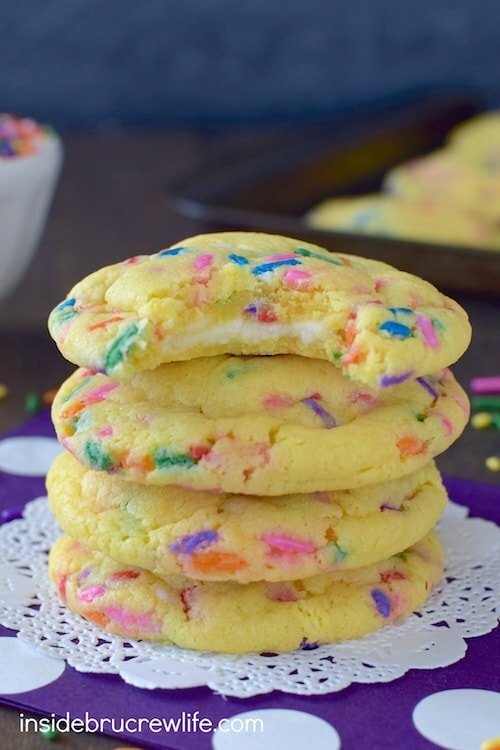 The hidden white chocolate center in these lemon funfetti cookies is a fun surprise to find when you bite into the soft cookie. Perfect treat to fill the cookie jar with. Combine the cake mix, butter, egg, and lemon juice and mix until a dough forms. Add the cream cheese and beat again until mixed in. Stir the sprinkles in by hand. Refrigerate the dough for 30 minutes to an hour. Roll the dough into 24 even balls. Flatten the balls one at a time and press an unwrapped candy into the center. Form the dough around the candy bar and roll into a ball again. Bake at 350 degrees for 10 minutes. Let cool on the cookie sheet for 2 minutes before removing to parchment paper on the counter to cool completely. Do not over bake! These cookies will look undone, but they set up as they cool. Store in a sealed container on the counter. Makes 24 cookies. These look perfect. I love that white chocolate streak in the middle! Thank you 🙂 Yes, 29 is great. Wink, wink! 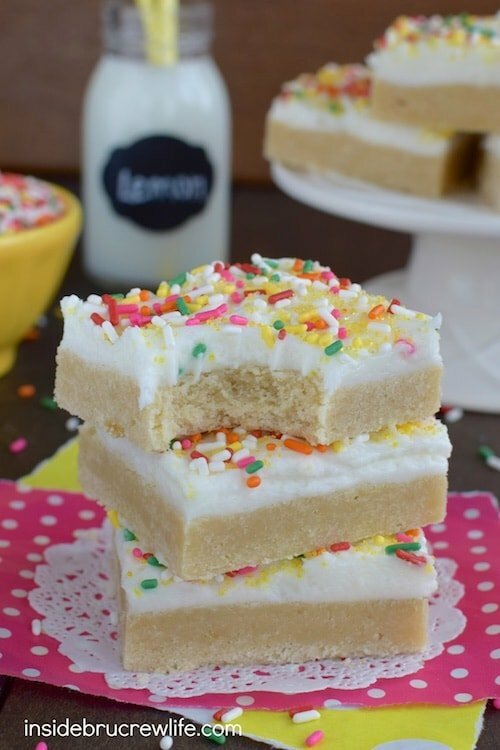 Lemon, white chocolate, sprinkles – I love everything about these cookies! I’ve been loving all things lemon lately! 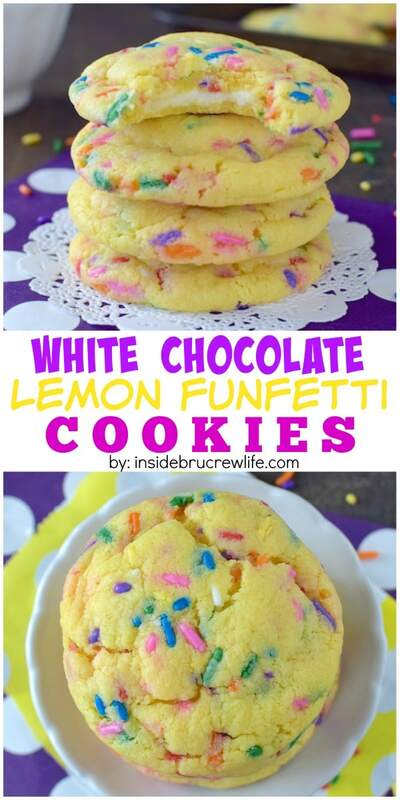 Love the white chocolate center in these cookies! 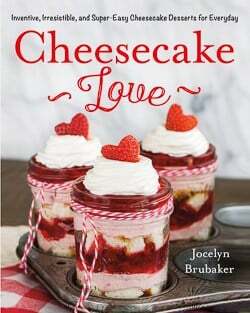 You had me at funfetti, Jocelyn! 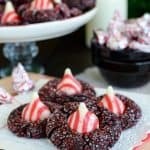 These cookies look gorgeous! I’m loving the white chocolate and lemon flavors. Such a perfect combo! Pinned! White chocolate and lemon work so well together! Thank you for the pin love! I have an April birthday, too… only the 10th anniversary of my 29th was about 16 years ago! I don’t mind getting older, either – things just keep getting better… more blessed. I hope your birthday is awesome! And… these cookies are gorgeous. Thank you and yes, I agree…things do keep getting better and blessed. Love these Jocelyn! Such happy pretty cookies!! Happy early birthay, Jocelyn! These cookies are a great way to celebrate. Love the lemon and white chocolate combo. Oh my goodness these are adorable!! 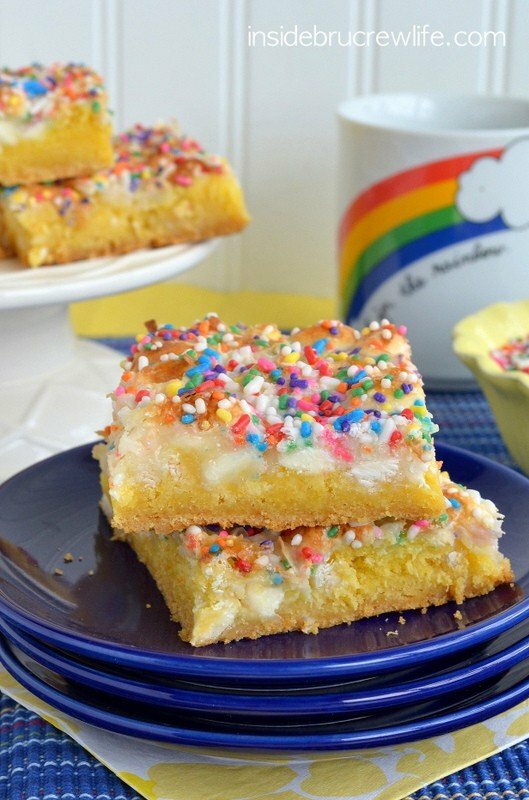 Love the sprinkles and that bright yellow color! I also love that the dough doesn’t need to be refrigerated! Thanks Melissa. These were fun ones to make up. Actually this dough does need to be refrigerated, so you can form it around the candy bars. I’ll have to re-read my post to make sure I made sense since I wrote it late last night! LOL that is too funny. I do that too – go through my archives and say OMG! I need to share that!! 🙂 Love these! 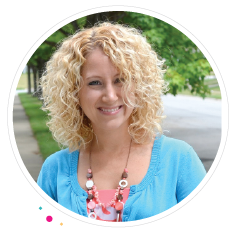 Happy birthday anniversary, Jocelyn! (I do want to note that you are only celebrating a birthday from your 20’s because you haven’t hit your 40’s yet. THE BEST decade. I choose to celebrate the anniversary of my 43rd. 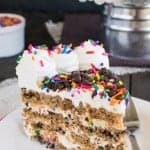 🙂 ) Sprinkles are the best way to celebrate any birthday and/or anniversary! So true…give me a few years and I will be upping my “anniversary” age. And I agree, sprinkles are the best for anything! Oh, definitely try the stuffed cookies…they are so fun to make and to eat!!! These look really yummy and soft. The chocolate on the inside looks like a nice surprise. Where did you find the white chocolate centers? Looks super tasty. I found the Dove chocolate bars at Walmart, and I have seen them at Target too. Hope you are able to find them! These sound fantastic! Love the idea of putting those chocolates in the middle, especially white chocolate. So inspired right now! These are FANTASTIC! They look so gooey and I’m adoring that white chocolate center. 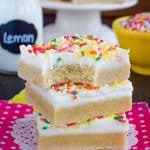 Plus, lemon and funfetti in one? Genius! I want to live in your head, girlfriend! Hahaha! There are so many crazy ideas swirling in my head every.single.day!!! Thanks girlie!!! Oh my goodness…I LOVE these! 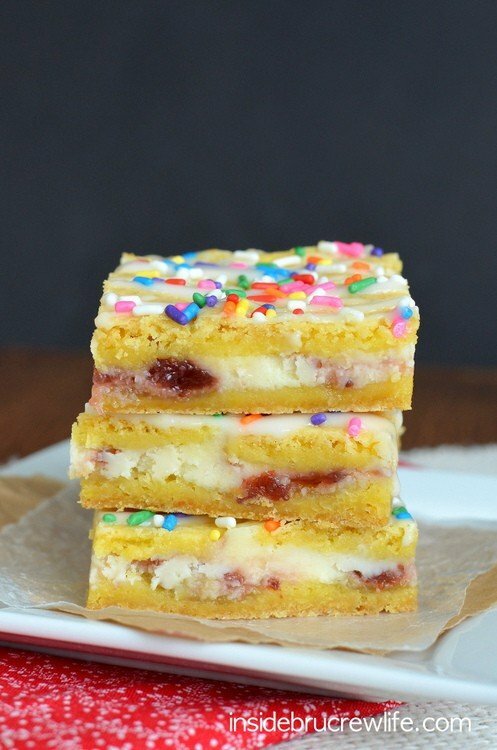 🙂 All the sprinkles, the yummy white chocolate in the middle…absolutely delicious!! I love your attitude about age! I feel the same way – I am happy with my age. I’m actually way happier now than I was in my 20’s! PS, glad you had a great Easter! I laughed out loud about your birthday! Own it girl! 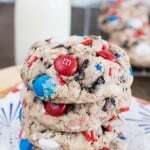 And also eat some of these awesome cookies. Girl, I totally agree with you! 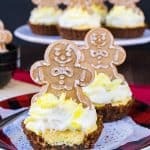 I workout so I can enjoy these yummy treats too! I’m going to have to steal that mathematical equation for my birthday. Love it! Also, love that you stuffed candy inside of cookies. This will now be happening weekly. Pinned.